How Can I Safely Get Rid of Raccoons on My Property? Although it is advised to have licensed and qualified wildlife control specialist provide raccoon removal services for your home or property, they are still a few do-it-yourself strategies and methods you can implement to assist in hindering raccoons from trespassing onto your property or gaining entry to your home. Continue reading to learn some quick and easy ways you can do your part to prevent nuisance raccoons. Leaving pet food dishes with dog or cat kibble in them is a common practice that many Americans are accustomed to; however, this is also a perfect way to attract wild raccoons to your house or property. Cat and dog food is a perfect dinner for raccoons. Wild raccoons love the taste of cat and dog kibble and remember where to find it night after night once it’s found. If you have pets that are fed outdoors, be sure to slip the pet dishes inside every night before bedtime. This way, during the day you can still feed your pets outdoors, but at night you are leaving anything outside to attract raccoons and other wildlife to your home. Squirrel feeders are also a tasty treat for raccoons. You may want to think about removing these as well if you are experiencing raccoon problems. If you are the type of person that prefers to take your garbage out the night before trash pickup day, you may also be the type of person that attracts raccoons to your home. A trashcan is like a free buffet for wild raccoons and other critters. Any scraps of food left behind in the garbage can be sniffed out and found by animals. They will rummage and rip through everything inside the containers, leaving a large mess all over the place for the neighbors to see the next morning. The best advice is to bring your garbage cans inside your garages or sheds overnight so that wildlife cannot gain access to them and make a mess all over your driveway. Wild raccoons are intelligent and thrifty animals. They are one of the most common mammals found in attics, crawlspaces, sheds, roofs, under porches, and more in residential neighborhoods. This is because they are great at finding vulnerable areas and access spots to a home or property. This roof shingles, purposes and window seals, broken hinges on shed doors, and more are all accessible for them. Once they gain entry inside, they have the potential to make quite a mess. After a certain amount of time, you can expect ripped and soiled insulation, floorboards, drywall, ceilings, and more. These methods can be costly and sometimes not covered under homeowners insurance policies. 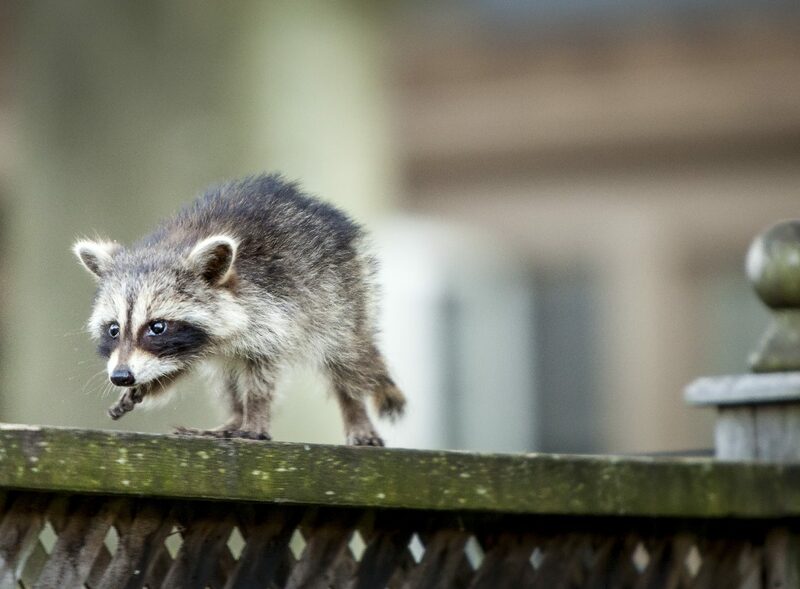 This is why it is important to hire a professional Indianapolis raccoon removal business to thoroughly inspect your home and property to be sure it is animal-proof for the season. Call 317-257-2290 for non-lethal, economically-priced raccoon removal and control in Indianapolis, Indiana and its surrounding counties. We are DNR licensed and insured wildlife rescue specialists that provide a long list of wild animal removal and control services for both residential and commercial properties. We also offer emergency service, bat-proofing, and minor restorations for bat damages! Call 317-257-2290 to request a free estimate, today. This entry was posted in Raccoon Removal and tagged get rid of raccoons Indianapolis, Indianapolis raccoon cleanup, Indianapolis raccoon removal, raccoon removal and control. Bookmark the permalink.